From time to time, the Finger Lakes Grape Program looks for financial support from agri-businesses to supplement our commitment to bring affordable, research-based knowledge to producers in New York State. Sponsorship opportunities exist to support some of our educational workshops and support our newsletter. Each sponsorship opportunity listed below provides information on sponsorship costs, target audience, estimated audience size, and company recognition. 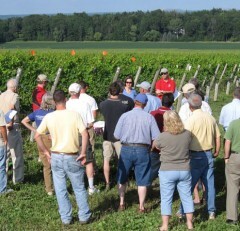 The Finger Lakes Grape Program may seek company sponsorship of some of our educational meetings and events. Four Newsletters - April, June, August and December, with the possibility of two extras. A confirmation email will include instructions for sending copy of main ad, company logo and 3 line text copy for weekly publication.